The unexpected and unexplained occurs every day in my garden. Some of these surprises are baffling - how could a Yucca torreyi which has lived in the front for more than 10 years suddenly die? Others are whimsical - a flowering stalk of spider lily (Lycoris radiata) jumped up outside the study window and neither of us recall planting it. 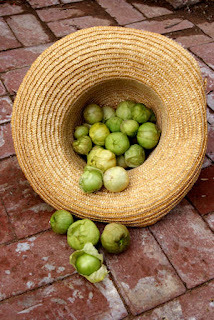 And some are a gift, bounteous and undeserved, like this year’s tomatillo crop. Tomatillo is a member of the massive genus, Physalis, most of which are known as ground cherry. There are a number of species native to the Sonoran desert and all desert peoples before us ate them either cooked or raw. The ones we find in markets and eat with such relish, are most often indicated as Physalis ixocarpa but the taxonomy is nightmarish, and far from reliable. 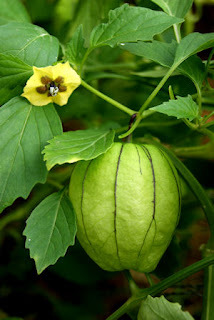 However, what is clear is that some form of tomatillo has been eaten in southern and central Mexico by both the Aztec and the Maya before them. In the language of the Aztec, Nahuatl, everything that vaguely looked like tomatoes was known as tomate with some kind of modifier attached to declare which was which. Hence, our tomato was called jitomate and our tomatillo was simply tomate or miltomate. These names are still used in Mexico although in some regions it is also called tomate verde. Once the tomato got to Spain someone got lazy and dropped the modifiers, turned it more Spanishy, and we have the word tomato. 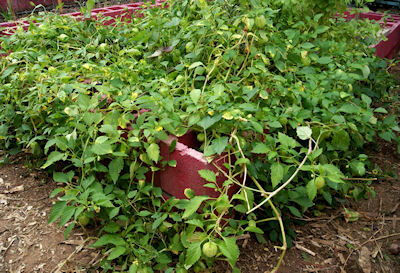 How the small green fruit of Physalis became christened tomatillo (little tomato) is still murky. Whatever its origins or name, it is a curious little fruit,enclosed in an inflated husk which it then grows to fill up and ultimately to break through. If you fail to find one in time and it rots away, it leaves a husk that looks like a fragile net on the ground. I first noticed them as mystery plants germinating in the vegetable bed in May. Lots of things find their way into these beds, and I always leave them until they grow up enough or flower to find out who they are. At first I thought they might be basil seedlings, and by the time it was obvious what they were there they numbered in the dozens. As the plants continued to grow over the summer I became more and more attached to them. Few things do well in the summer and often I grow crops in the vegetable garden just to keep the soil alive, usually relying on sweet potatoes and black-eyed peas. I left them alone and they sprawled out to smother the two beds in which they grew, falling over the sides, climbing up leftover trellis’. In early September they began to flower exuberantly and fruit began to set. The plants repeated this cycle almost weekly until we were able to go out daily and come back with a handful or two of the sweetly tart fruit. They are still going, showing no sign of slowing down. I can only imagine that they arose from the compost pile. I planted tomatillo seed many times over the years and while they grew extravagantly I got no flowers or fruit from these efforts and quit a number of years ago. Now I am hooked, I want this crop every year so I have been leaving some of the fruit that got too ripe, or fell off, right where it lands in hope that there will another banner year, without my intervention, for this delectable, little green fruit. Tomatillo makes wonderful fresh salsa by simply blanching it or roasting it lightly, then chopping it with onion and hot peppers. It is irreplaceable in posole, and a green sauce made of it and other fresh peppers, onions, garlic and oregano makes delicious enchiladas, quesadillas or stew. There are green moles based on this fruit as well. The fruit freeze well, as does the sauce, so when the bounty is gone you can still enjoy it. Signs of fall are subtle in the desert, longer, golden shadows, days that start later and end sooner. Most years, and this one is no exception, temperature tells us nothing - it is still summer by that gauge. Yet, in all this confusion there a number of good plant clues and none are more welcome than two of my fall flowering bulbs - oxblood lily and naked lady. I got my first oxblood lily (Rhodophiala bifida) years ago when Mark Dimmitt of Tucson gave me a generous handful from his garden. Knowing little about them or their cultural desires, I planted them all over the place. In rocky areas, in good soil, in the shade, in the sun. Everyone of them has thrived and multiplied. 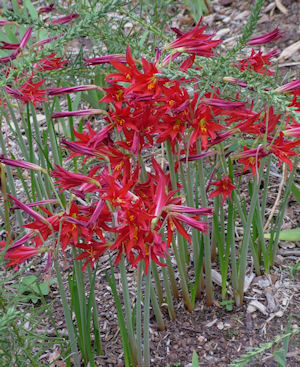 A South American relative of our familiar garden amaryllis, oxblood lily is one of those odd bulbs that sends up a flowering stalk before the leaves emerge. Stalks pop up quickly, literally overnight, and announce September as regularly as the turning of a calendar page. The flowers are deep, clear red with an acute tip that makes them look like stars. I can’t get over how reliable they are, and how little they require from me. While they have shown that they will grown in almost any condition of sun or shade, those with the most sun are the first to flower. Plants always surprise me, and none more so than the flowering of the naked lady. A couple of weeks ago I was out of town, and Gary reported that a hefty stalk was pushing up beneath the apartment window. Baffled I could not remember planting any bulb there, save the long established oxblood lilies, and we noodled about what it could be. I have a terrible habit of acquiring bulbs, either by purchase or as gifts, and popping them in the ground without the benefit of tags. I pledge every time to change my ways, and often I have, but this one clearly got away from me. The day before I was to return, it opened its first flowers and it was obviously a naked lady (Amaryllis belladonna). I was excited and crossed my fingers that it would still be in flower when I got back. I should never have worried. Naked lady sends up its foot tall flowering stalk producing anywhere from 2 to a dozen flowers on its terminal cluster. It is a show that develops slowly, opening one or two at a time, giving you a long time to savor and enjoy the bloom. Ours set 10 flowers and took 12 days to finish. Mine is the common pink, the color of a baby’s fingernail, although darker ones as well white are available. I have had a planting of this bulb over by the jacaranda tree since 1997 and they have never even hinted at flowering. 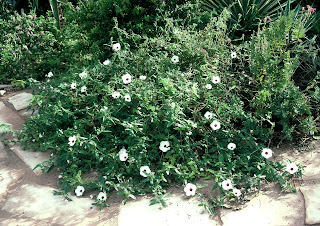 In its homeland of South Africa it grows among rocks and other dry places, so I imagined it to be at home in that location. Clearly I was wrong, and the one with a bit more water, and slightly more enriched soil, has show me how to grow this beauty. The history of naked lady in European and Caribbean gardens is long and poorly documented. It is clear that it was brought to England in the early 18th century and that it was Linnaeus who gave it its name in 1753 although there is scholarly dispute about whether he was looking at the right plant when he did. The Portuguese probably brought it originally to the rest of the world’s attention and it appears to have followed the early trail of the slave trade, Africa to the Caribbean, to England, Portugal and Spain and back to Africa. It has been a common garden plant in all these places for centuries, but unfortunately no one thought to keep track of when and where it arrived. So while reddened leaves are rare, and nippy nights are months away, I can still call up a fall feeling every time I go out in the garden and enjoy my bounty of fall-flowering bulbs. I find birds in a garden irresistible. I consider having a wide array of avian visitors as a signal of a healthy place, one where they feel welcome, where their needs coincide nicely with your garden’s. You do not after all see many birds hovering around barren lawns, or rifling through fruit orchards. Some are incredibly easy to please - the silver-throated mockingbird, the voracious house sparrow and the cranky starling - but I find that they fade into the garden background. To get the others birds, the ones that come in quietly, make you hold your breath and hope they do not fly away too soon you need a much better place. Watching birds is a quiet time - sipping tea or coffee, waiting in the shadows of the porch for them to move over just a to catch a better glimpse or to be assaulted unexpectedly by the aerobatic pranks of hummingbirds while I water or weed - is more relaxing than a spa, and cheaper too. This is an odd in between time of year for the birds in our garden. The hummingbirds, thrashers, cactus wrens and towhees have finished raising their young and those youngsters are racing around trying out their skills at territorial defenses, guarding food, and preening. They are a delight to watch having much less fear and wariness than their elders. The quail still keep their youngsters close but it won’t be long before they, too, are hard to tell from the adult females and become just part of the crowd. Occasionally, the odd warbler or vireo passes through but you have to be lucky with these guys. They rarely stay long and I find that they are punctuation marks on by garden bird watching, entirely unpredictable and always a splendid surprise. Then there are time times when a bird shows up that is not particularly uncommon or unusual for the area, but is shy and seldom seen. That is how it was a week or so ago when the roadrunner showed up. One of our neighbors used to put out chicken bones and such from time to time for the foxes that live in the neighborhood. To both our and her astonishment it was a roadrunner that took in most of the free grub. She is now gone and we haven’t seen a roadrunner in the yard or around the area in a long time. Then one morning, as I was puttering with something at the sink I saw a full grown roadrunner stabbing at the ground in one of the front patio beds. The bill of a roadrunner is serious, long, thick, and sturdy. They feed on small lizards, snakes, an array of insects, and even nestling birds if they can find them. It was after something and that bill was like a ram going into the ground. I called Gary and a weekend guest over for a look and we were mesmerized by its determined activity and exquisite plumage. It was clearly a young bird, both in size and in purity of feathers, and we were delighted to see it so close. But one of us moved, or shifted and even though we were in the house and it was in the garden, it picked up that one tiny movement and took it to mean trouble. It raised its head swiveling and turning its big, wide eye over the area with its tail flying straight up. All of these are poses and signals of the wariness of the wild in these most primitive of birds. Finally, after looking around some more, it gave up on feeding and jumped to the wall giving us a splendid view of his blue-tinged tail and wide, unfeathered eye ring. These are odd birds and look more like the fossils of proto-birds than any of the others that fill the yard. Roadrunners are related to cuckoos and have a lineage that goes back almost as far as birds themselves. If you have one in your hand, you will find that they have a small hook on their wing, at their wrist. In roadrunners it is more or less as useful as our appendix, but in other relatives it allows the bird, particularly baby birds, to grab a limb or bark and climb out of harm’s way. But this one considered that the patio had become a nervy locale and after a look or two around, more waving of its tail straight up to the sky, it jumped off the wall and we could not find it again. Yet even this brief look was enough to let us bask in the wonder of sharing, however briefly, in the daily back and forth of another life that also finds our garden attractive. It all began with a long-delayed renovation of the front patio. This charming area had waited patiently for us to get around to routing out the weedy undergrowth of moss verbena, the forest of seedling Baja fairyduster, and the overwhelming black dalea for a couple of years - since Gary had finished the patio in fact. Finally last fall it was time, and I cut and pulled and pruned. We planted a few things that had either been taken up to make room for the stones, or that were in need of some relocation. It began to look like a real place. But the bed nearest the door needed work, it needed that ‘something’, that final touch that would make it all come together. A friend suggested a big agave as a centerpiece of the bed. The centerpiece idea was good, but any agave large enough to do the design trick was too large for the spot. We mulled about a Hesperoyucca whipplei for a while, chiefly because there are three in the shade crying for a home in the ground but it just wasn’t right. Without warning, the solution came to us one evening, the desert milkweed. This desert milkweed (Asclepias subulata) had been living in this spot by the walkway since before the walk was taken up and redone, before the wall was built, and long before the patio was finished. It was an old hand at our minimal watering scheme in the front, and it was so large that it needed to be cut back from time to get through to the front door. It was actually a little too close to the path, but then who was really in charge here anyway. But it would look splendid rising up out of those perennials a few feet over, more in mid bed than the edge. Last November we dug a hole for it, dug it out, planted it in the ground, leaving the seedling it had produced in the middle of the path as insurance. We watered it, we coddled it and by the spring it was clear it was dead and not coming back. I left the stems much longer than necessary hoping for a miracle. Nothing. We then dug up the insurance seedling, planted it more or less in the same spot and since it was smaller and younger we thought we had a great chance. Hah, since when have plants listened to our desires? It began to fade even more quickly than the other one, and although the sticks are still there in a vain hope that something will come from the root, it is clearly dead. The obliging black dalea covered up the corpse for us, and we haven’t had the heart to get rid of it yet. And then, the plant rose up and showed us the way. One day this summer, as I went out to lay hoses around to water, I noticed a mass of small stems, with even tinier thread-like leaves at the edge of the bed. I was busy, it was early, we had morning chores to do, and I parked it in the back of my mind. The next day while getting the paper, I stopped to notice it, thinking that perhaps it was a wayward desert broom. 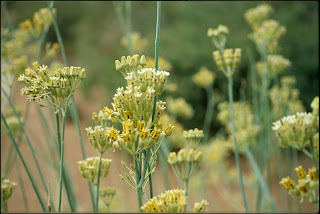 To my amazement, it looked just like a desert milkweed, it was a desert milkweed, how could this be? Well, how would I know? but there it was, a 6-inch bunch of around two dozen stems full of leaves and vigor on the second day over 110, looking like a little chick that just emerged from its egg shelter. It is in the original spot, the one that is too close to the path. Now the great quandary, move it again to the spot we would prefer - it clearly likes the heat, or leave it alone and cope with the endless pruning and pushing and cajoling that will be inevitable when it grows up. Can’t say that we know yet, it will take a bit of thinking to come to the right conclusion. But in the meantime, there it is, a chipper little reminder that even in the direst weather, some little life out there is content and happy.